(Newser) – This week, a Washington state mom made headlines when she blogged about her kids' terrible sunburns after school; the girls hadn't been offered sunscreen during a field trip. 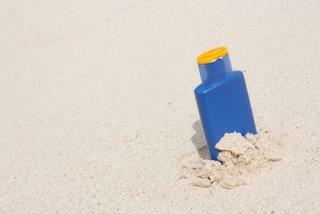 Turns out that anti-sunscreen policies are everywhere, USA Today reports. That's in large part because of regulations barring children from bringing drugs into school, prescription or otherwise. Sunscreen counts as an over-the-counter drug. The moronic logic of 'health and safety' guidelines. These are the kind of people who stop at a red light at 3am when theres no traffic about, just because the law says so. The bottom line of all this is that we harm our kids in the name of protecting them. By us I mean the US culture. Idiocracy uber allus. Once again, the U.S. proves that it has the dumbest school administrators on the planet. My god, do they all get their brains sucked out in college?